Mike Sylvester is a member of Democratic Socialists of America in Maine. Sylvester worked for over twenty years as a labor organizer, helping low income workers throughout the country build bargaining units and negotiate contracts. He lives on Peak’s Island with his wife, and currently works as the owner-operator of a golf cart rental business serving visitors to the island. Maine Clean Elections funding powers truly democratic elections. Southern Maine DSA endorsed Clean Elections candidates Betsy Sweet For Governor, Jeremy Mele For State Representative, Mike Sylvester, and Bob Maheu only have until tomorrow, April 20 to submit their $5 qualifying contributions. Will you help keep our democracy accountable to citizens, not corporations? Maine’s reactionary governor, Paul LePage, has warned voters that his state’s legislature is being influenced by a “foreign socialist ideology.” Mike Sylvester is hoping to show that democratic socialism is right at home in Maine’s communities. Monday, June 6, 2016 Portland Public Library 5 Monument Square (Congress & Elm) Meeting Room 5 Portland, ME. In April 2017, Quad Cities Democratic Socialists of America member Dylan Parker was elected to the Rock Island City Council, 5th Ward Alderman, with Democratic Socialists of America support. Parker is now the thirteenth DSA member holding elected office in the country. With his victory, Parker joins a list that includes Carlos Rosa, Chicago’s 35th Ward Alderman, Mike Sylvester, of the Maine House of Representatives, and Julie Ann Nitsch, Austin Community College Board of Trustee in Texas. “DSA is very excited about our own member Dylan Parker being elected Alderman of Rock Island, Illinois” DSA National Director Maria Svart Said. “You can now find DSA chapters in nearly every state in the union, and our public electoral activity and success can only grow from here.” In addition, DSA hopes that Khalid Kamau, a member running for city council in South Fulton, GA, will win the next DSA electoral victory on Tuesday, April 18th. DSA FOLKS and others who care about workers struggles... AT&T ON STRIKE. If you are kicking around Portland this weekend, stop by the Marginal Way store and spread some SOLIDARITY.... and bring water and fruit and chips and cookies. An injury to one is an injury to all. #NOOUTSOURCING — with Kevin M. Ready, Barney McClelland, Seth Baker, Vanessa Sylvester and Mike Sylvester. March 2017, Portland joined several cities across the nation for a series of rallies under the name, “The People’s Defense.” Protests were centered around the slogan: We Object. Pro-democracy and civil rights advocates objected to a number of issues — Trump’s travel ban, spikes in hate crimes, health care reform, budget cuts to the EPA, Internet privacy — but most were focused on what they considered the most pressing and important: the nomination of Trump’s pick for Supreme Court Judge, Neil Gorsuch. About 150 voters gathered on Sunday at Portland’s City Hall to object to Gorsuch, a candidate who’s both praised and criticized for his conservative views and strict constitutionalist perspective. One can see the ideological divide over Gorsuch locally in recent stories from the Portland Press Herald which report that a group of 98 Maine lawyers wrote and signed a letter in opposition to Gorsuch to Maine’s Senators, while a separate group of 49 signed one in support. The speakers at the rally included former State Rep. and Bernie voter Diane Russell; Mike Sylvester, a State Rep. for District 39, and founding member of the Maine Democratic Socialists of America; Glen Brand, the chapter director at the Maine Sierra Club; Barney McClelland from the AFL-CIO; Maine Education Association President Lois Kilby-Chesney; and Michael Langenmayr, a steering committee member of the advocacy group Progressive Portland. 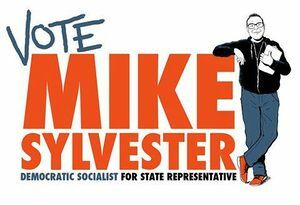 In August 2017 Mike Sylvester stood for election to the Democratic Socialists of America National Political Committee, at the National Convention in Chicago, from Maine Democratic Socialists of America. Mike was one of the co-founders of the Southern Maine DSA. He won his election to the Maine House of Representatives as an open Democratic Socialist and Labor Democrat and serves on the Labor, Commerce, Research and Economic Development committee. His bills sought to protect water as a human right, to provide opioid safe use spaces, to allow public sector workers to strike, to create cooperative ownership and micro loan strategies and to protect teachers for union activity. Members of Maine Democratic Socialists of America Public Facebook Group, as of May 12, 2017, included Mike Sylvester. Saturday, April 7 at 1 PM - 3 PM. Luther Bonney Hall, Portland, Maine 77059. We at Ringelstein for U.S. Senate are thrilled to announce that we are hosting a summit on the importance of getting money out of politics on April 7, 2018 from 1:00-3:00pm at the University of Southern Maine. Lawrence Lessig|Larry Lessig, leading academic on corruption in American politics, will keynote the event. The event will also feature a talk by University of Maine School of Law Dean Danielle Conway and small discussions led by the Sierra Club Maine, the Committee for Ranked Choice Voting, Equality Maine, Southern Maine DSA, and Maine Citizens for Clean Elections. In addition, there will be a panel discussion on corruption with Senator Justin Chenette (Saco), Rep. Mike Sylvester (Portland), gubernatorial candidate Betsy Sweet, and former Rep. Harlan Baker. In 2018, a number of Democratic Socialists of America members are running for seats in the Maine House of Representatives, including Mike Sylvester (District 39), Tim Goodwin (District 23) and Jeremy Mele (District 19). The Southern Maine DSA is considering endorsing all three of these candidates and told me that much of the work in their chapter involves deciding which campaigns and candidates to back. From a March 6, 2019 by DSA National Electoral Committee statement "DSA Elected Officials Support Teacher Power and Working People Everywhere." Endorsing Democratic Socialists of America members included Mike Sylvester, State Representative, Maine. This page was last modified on 9 March 2019, at 15:24.